As any biker or golfer can attest, half the fun of a sport is upgrading and accessorizing. The Microsoft’s Surface Pro is much the same. The tablet itself is beautifully designed, but it becomes dramatically more functional when you add on a Type cover, and then you’ll need a case, and that dock looks really useful…well, you get the idea. From covers to keyboards, mice to mobile tools, here are our favorite accessories for the Surface lineup. Bought a Surface? Buy yourself an Arc Touch Bluetooth Mouse. Now. This $69 add-on is the perfect complement to the Surface. 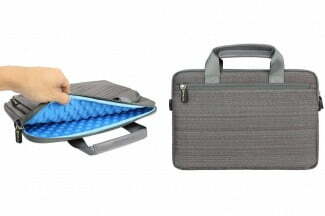 Fold it flat to slip into your briefcase or backpack and the mouse automatically turns itself off to save power. The scroll buttons offer haptic feedback that makes it feel like a wheel whirring beneath your finger — a smart design. And it uses the low power Bluetooth 4.0 LE spec, which means it may not be compatible with your older devices, but works just fine with Surface. Plus the flat gray color scheme even matches the Surface line beautifully. We have a love / hate relationship with cases. They’re a necessary evil, something that obscures the beautiful finish to a product that a company has spent weeks or months crafting, but at the same time protecting it from harm. The dux case for Surface Pro 3 rides the line nicely, thanks to a rubberized bumper that surrounds and encases the screen to protect the Surface Pro’s edges and back while still allowing access to the kickstand and all the buttons. It has a clear polycarbonate back, and the company claims it can handle drops up to 1 meter. Microsoft has had a couple of generations to perfect the Type Cover and has added a magnetic strip that lets you to fold the keyboard up a bit, so it sits on your lap at a comfortable angle. The touch pad also seems to more responsive and accurate than the last incarnation. This is a QWERTY keyboard with the full complement of function keys. The keys are backlit and the proximity sensor tells them when to kick in. You could argue that Microsoft should include a cover in the base price. We’d agree. Still, this is an indispensable accessory. Hitting the trail but want to bring along your tablet? We like the UAG Rogue, which builds military grade protection into its case thanks to Frogskin Technology — a proprietary soft rubberized material that’s easy to grip. It meets military grade drop standards (apparently the military drops a lot of stuff), it’s water resistant, and it even includes a slot to keep your stylus convenient and at hand. 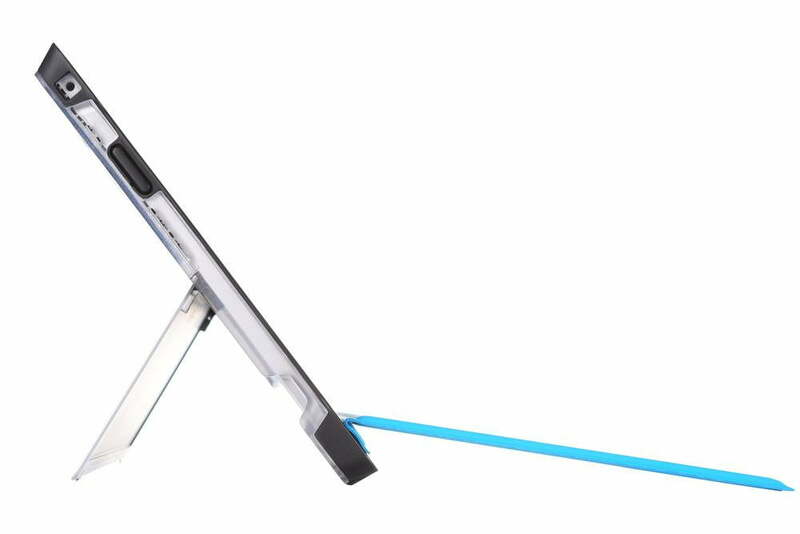 The Surface Pro’s kickstand is replaced with an aluminum, five-position stand, which is less versatile but still very functional. Related: There’s now a Surface 3 with four gigabytes of RAM and 64GB storage or $549. The best accessories for a product often come from the manufacturer; the Surface is no exception. Anyone looking to boost the versatility and power of an already pretty agile device need look no farther than Microsoft’s own docking station. Surface has a USB port and video out, but the station adds on five USB ports and Ethernet, in addition to mini DisplayPort. As with the entire lineup, we feel Microsoft’s dock is too expensive, but it is solid and practical. This bag is practical for business travelers with a Surface Pro 3. There’s a nice padded pocket for the tablet with fluffy fabric and foam padding inside. The exterior is a business-suitable gray fabric. There’s a large zippered pocket in the front for extras, and a zippered pocket on the back that’s flush with the tablet and ideal for paperwork. The handle is reinforced and padded for comfortable carrying and there’s a removable shoulder strap as an alternative option. You can opt for up to 512GB of built in storage, but the entry level Surface Pro 3 comes with as little as 64GB. Fortunately, there’s a micro SD car slot tucked away behind the kickstand. Use it. A 64GB memory card from SanDisk will double that base level of storage and costs a pittance. Though it can’t compete with the purpose-built Microsoft Type Cover, this alternative is a full $100 cheaper. 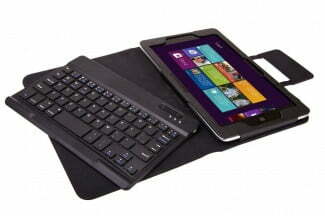 It has a durable fake leather case that the tablet can slide inside. The cover plays host to a removable Bluetooth keyboard, and there’s a stand that can be used to prop it up in the laptop position. The keyboard is compact, there’s a bit of travel in the keys, and it should be good for 60 hours of use on a single charge. It’s not a bad option for the money. 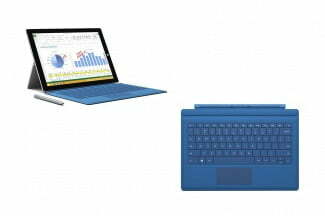 If you’ve blown your budget on the actual Surface Pro 3 then this cheap accessory kit should tempt you. 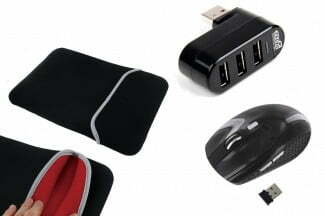 There’s a simple velvet pouch to slide your tablet into, a USB hub with three ports for plugging in various other accessories and gadgets, a wireless mouse with a wee USB plug, and a six-foot-long mini DisplayPort to HDMI cable. There’s a small bag to keep the extra bits in as well. You can’t expect great quality at this price, but this kit could do the job if your expectations are reasonable. You’ve blown a chunk on that Surface Pro 3 – so carry it around in style and show it off! We like sleeves like this one from Snugg, which tuck easily under your arm and protect your tablet while you travel. A magnetic clasp holds the front flap shut, and there’s a small pocket under it for business cards. Microsoft charges a lot for extra cables and adaptors, so you might want to give this a try. 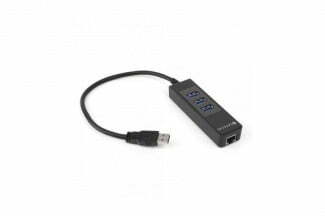 It offers three USB 3.0 ports and an Ethernet port as well. You can get speeds up to 5.0Gbps with USB 3.0, so there’s plenty of bandwidth. Install the supplied driver and it’s a plug-and-play accessory. Easy to use and great quality for the price. Jeremy Kaplan also contributed to this article.